Sometimes, you just need someone to blame. And this week…that someone is LeBron James. A guy in Michigan told the policeman who pulled him over for DUI that LeBron’s decision to go to the Miami Heat was the reason he was drunk. No lie. Of course, since he was drunk, he kinda got the facts wrong. He thought LeBron was with the Boston Celtics — instead of the Cleveland Cavaliers — but it was still upsetting, so that was why he drank too much. It was clearly LeBron’s fault. Which got me to thinking — we can all milk this situation for a couple of more weeks. I mean, LeBron milked his announcement — which should have taken all of 30 seconds — into an hour television special. And the ESPY Awards were able to milk it yet again into a hilarious sketch on Wednesday night’s show. Why shouldn’t we all blame LeBron for something this week? Can’t pay your rent? It’s LeBron’s fault. Miss a work deadline? LeBron made me do it. Cheat on your wife? 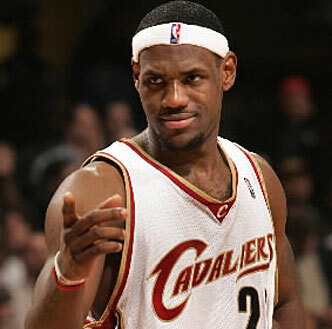 Did you see what LeBron did? I had to, man. Use your brain. Throw the blame.